If ever I were to open a "Proper" British Pub, I think I would call it "The Dog And The Hedgehog". There would be lots of deep dark wood on the walls, yellow brass railings polished bright, and hunter green paint elsewhere. Bottles of Hard Cider, Dark Ales, and fine Single Malt Whiskey would be on offer. Maisey, my buxom, brassy, and brilliant barmaid would bring you your Fish and Chips on a platter the size of a hubcap, and she'd greet you with a larger than life presence. "Cheers, Love! 'Ere's Yer Dinner! Tuck in!" Of course, pictures of Elizabeth would grace the walls. But in this case, it's simply a story of a new toy. 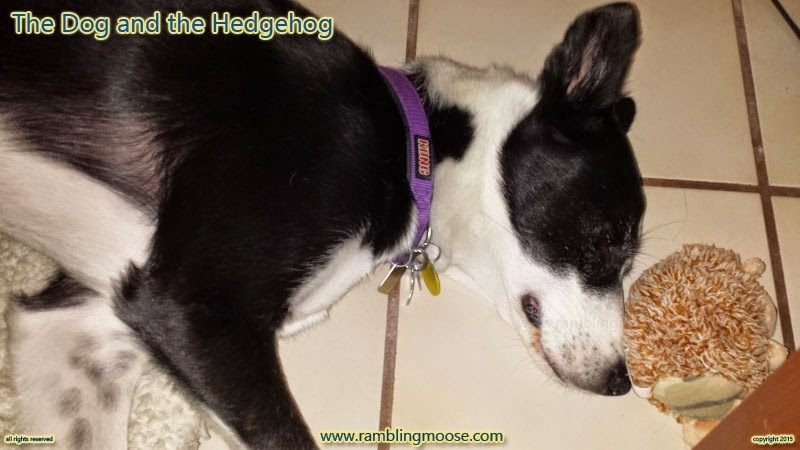 You see, my dog, Rack the McNab SuperDog (TM) has a fixation with his Hedgehog. It hasn't been destroyed, completely, yet. It has had its eyes chewed off in the grisly first few hours of it being given to him, and now is preened within an inch of its life. He got it in a care package from a good friend of mine up in Atlanta, Craig. The hedgehog was a bit of Swag from a computer show that he had gotten on a memorable trip to San Francisco. When I pulled it out of the box, Rack's eyes got big and it was a match made in heaven. It was also the first time I saw him assert himself towards a toy. Rack reared up on his hind legs and grabbed it from the room divider, a full 3 feet off the ground. A Meter high since we're talking about a British Pub. Fish and Chips would be quite nice right about now, come to think about it. Trotting off to his doggy bed, he settled down to blind the little plush toy in excitement. Like Lettie before him with her fixation with plush Squirrels, Rack loves his plush hedgehog. Hedgehogs aren't really common here. They aren't native to Florida or the US, and are quite better off living under hedges in Britain, munching on grubs, and living in their native habitat. Plush Hedgehogs are welcome though and we set off to look for a new one every time we went off to one of the handful of Thrift Stores here and there. I always look at the plush animals, and finally we found a second and New To Us Hedgehog. It made it home and sat out on the bar looking in at the kitchen window because you really do want to wash something like that in "superhot" water to kill anything that may have been hiding in the thing. Plush Hedgehog yes, bedbugs no. Once it came out, Rack had the same reaction. Mine. Please, Dad, Mine? He came over to me, and bore twin holes in my heart with two brown eyes. I held the older hedgehog in one hand, the new one in the other. Each time he reached for one, I moved the other out of reach. Finally he realized what I was saying, One, Not Both, and grabbed the new one. Settling down with his prize, he fell asleep next to the big green chair in the corner of the little house on the Island dreaming of new toys, Hedgehog, and Maisey the Barmaid bringing me some proper Fish and Chips with a dark ale on the side. Ok, maybe not the Fish and Chips, but you get the picture. Kid with a new toy takes it to bed and sleeps well that night. Now that he has two, I can actually wash the other one. You see, these plush toys get a bit stiff after use. You really don't want stiff quills on the outside of a plush hedgehog. That's for the real ones made of prickles and flesh and blood living happily under a hedge in a cool climate far away from here and a curious black and white dog.